which would typically be installed in the kitchen. My comments are almost identical to the poster below ! We had a Nutone intercom system in one of the homes we lived in. We thought it was the coolest thing. 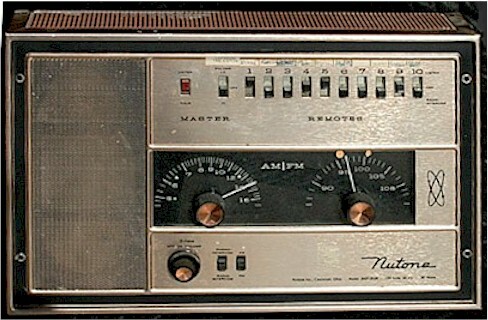 As kids, we played with the intercom feature for a couple of weeks, but after that my mom used it mainly as a way to hear the radio in multiple rooms as she did her household chores. The main console was in the kitchen-family eating area and there were speakers/stations in the master bedroom, the upstairs hallway, one in the basement laundry room, the living room, the dining room, and outside stations at the front, side and back entrances. We thought it would be fun to answer the door through the system, but we never used it that way. I guess we thought it might scare the person at the door to hear a voice from seemingly nowhere. Wonderful thing! the system I had in LAs Vegas could play radio,cassettes, leave messages, didn't have to go all the way downstairs to answer the door, one by the front door, one in the back patio, one in the master suite, one in the library, one in the music studio, one in the garage, one in the breakfast room one in the office...I could control which were on or off...during an "open house when we were selling heard my agent telling aperson that she had a better deal in another neighborhood! Great fun, want it here! Always good to know who's there and they don't know where you are, lovely for security! I have one of these in my house, main radio intercom is indeed in the kitchen. Two of the intercoms in separate rooms still WORK! Everyone jokes and tease me about it, but its a neat conversation piece, especially when they see it still functions. It is also a Nutone similar to the one pic, but larger and all silver metal. you were rich if you had this!